These days, Eddie Matos is best known nationwide as the spokesperson for State Farm Insurance, where he does commercials in both English and his native Spanish. 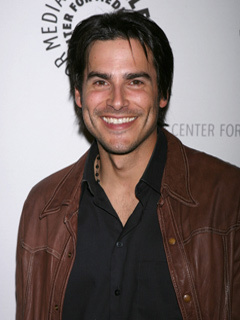 But soap watchers remember him best as Ricky on PC; certainly, the folks at ABC Daytime remembered him from that stint, and went on to hire him for the recurring role of Peter on GH before signing him to a contract as AMC baddie Ricky. He's become fast buds with co-stars Jordi Vilasuso (Griffin) and Alicia Minshew (Kendall). His birth name is Eduardo Matos. He was the drummer in a band called 23 Link Chain. He has one older brother and one older sister. He lived in Miami before moving to L.A. to try to make it as an actor. Thad Luckinbill (ex-J.T., Y&R) is one of his best friends.